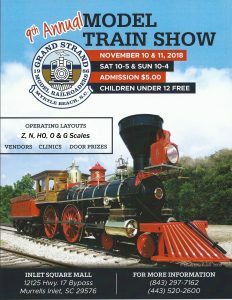 The GSMRR 9th Annual Train Show and Sale was held on November 10th & 11th, 2018 at Inlet Square Mall, in the former JC Penney store. With over 150 vendor tables and nine operating layouts, it was our largest show to date. Thanks to all those who attended. We look forward to seeing you again next year!